Eyeglasses are one of the easiest ways to correct your vision while expressing your personal sense of style. Advanced technology helps vision care specialists create lenses that correct several types of vision problems, such as farsightedness, nearsightedness, and astigmatism. A wide variety of designer frames enhances your personal appeal. Our optometrists and opticians in Maple Ridge can help you select the perfect lenses and frames to suit your individual needs and budget. Our eye doctors can assess the health of your eyes and perform visual acuity tests to diagnose any vision problems you may be having, and to determine how well you see. Evaluation of your eyes may include detailed tests using eye charts and sophisticated optometric equipment. Some of these tests look for refractive errors that cause blurred vision. Refractive errors are usually the result of an irregularity in the shape of your cornea, which is the transparent layer covering the front of your eye. Your cornea bends light so that it strikes a particular spot at the back of your eye, known as the retina. Bending the light in this way focuses the images carried on the light. An irregularity in the shape of your cornea bends the light incorrectly so that it strikes the wrong part of the retina, creating a blurry image. Refractive errors can cause nearsightedness, farsightedness, and astigmatism. Eyeglass lenses bend the light passing through the cornea so that the light strikes the correct part of the retina for clear vision. Eyeglass lenses also correct presbyopia, an age-related condition that affects your eyes’ ability to switch between faraway vision and close-up vision. Bifocal and trifocal lenses correct presbyopia. These lenses usually have one area for focusing on a close-up object and another area to focus on objects that are far away. Multifocal lenses offer progressive, incremental “no-line” correction so that there is a smooth transition between up-close and far away sections of the lens. 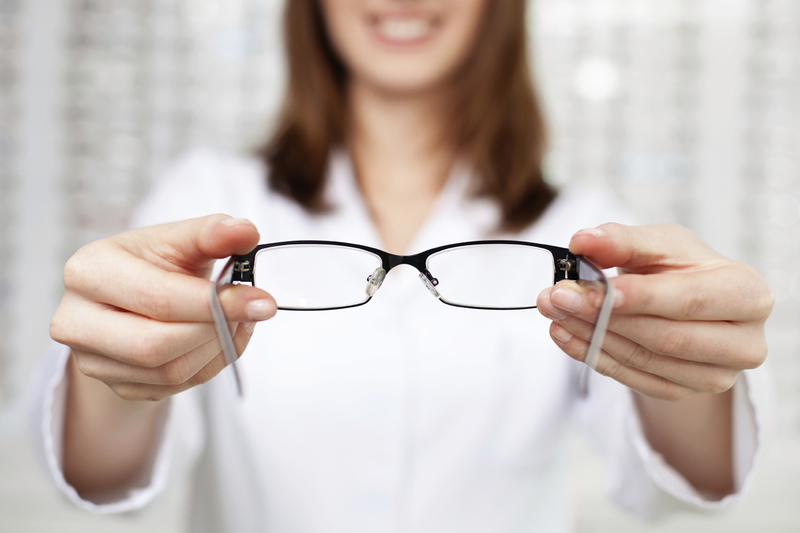 Our Maple Ridge optometrists and opticians can help you determine which type of lens is right for you. Get Your Eye Exam and Glasses Here! After your exam, our knowledgeable opticians will be happy to help you choose from a wide variety of designer frames from our in-store boutique. Up-to-date on the latest eyewear styles, they will advise you on the best frame shape and color for your face. We are your exclusive Maple Ridge retailer for the award-winning Danish eyewear brand, Lindberg, and French designer brand Lafont. We also carry sunglasses from Maui Jim, Serengeti and Ray Ban. We can help you find frames to fit nearly every budget. Many of our frames come with a 2-year warranty, but even our sturdy, well-built 2-for-1 discount frames include a 1-year warranty. Specialty glasses such as sports goggles and safety eyewear are also available. If you need eyeglasses, make an appointment with Maple Ridge Eye Care, conveniently located at 23015 Dewdney Trunk Road in Maple Ridge, BC. The eye care professionals at Maple Ridge Eye Care are ready to serve you. We also serve people living in Pitt Meadows and the surrounding communities. Make an appointment today by calling 604-463-4469.